If you click the three dots after a channel, and then select “Edit this channel” then you can rename the channel. I changed the name to “Trainings”. 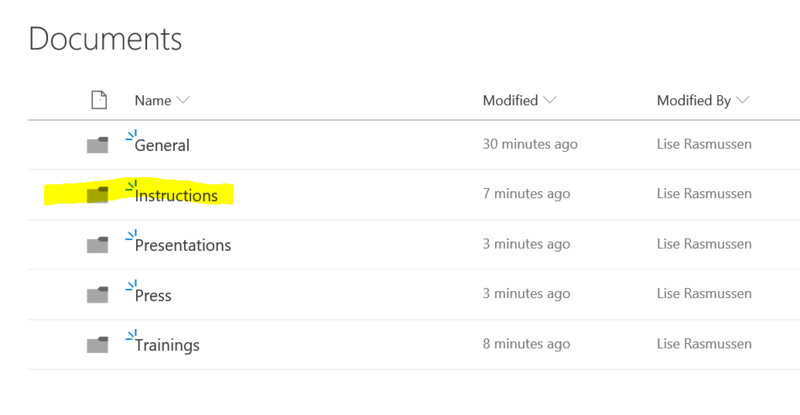 The effect was that the channel was renamed, of course, but the folder in my SharePoint documents library did not change name – it was still called “Instructions”. But.. the connection still works. If I upload documents into either Teams or SharePoint to that channel, the files are visible on both places. 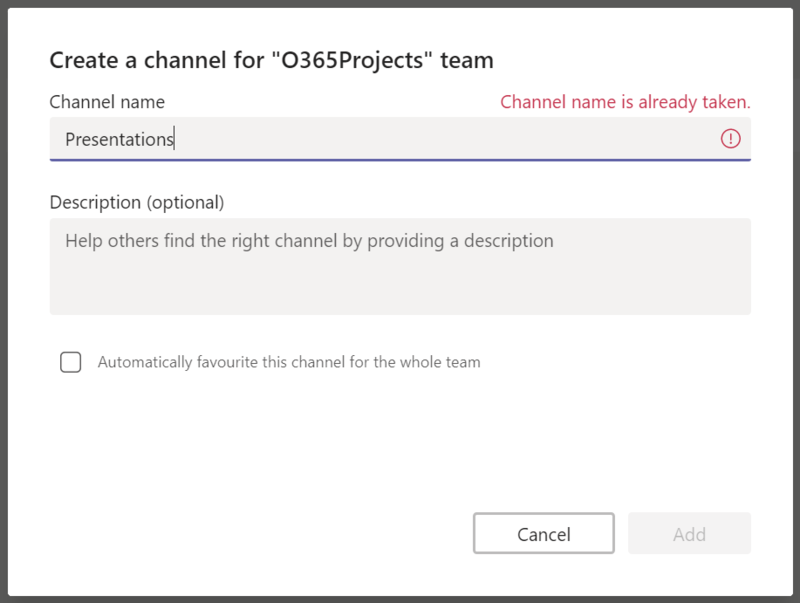 But of course, this could end up in confusion when you go to the SharePoint site and look for documents connected to that channel and the name is totally different. Anyway, this works, but not recommended. The natural step would be to change the name in the document library to the same, what happens then? That is in our next scenario! 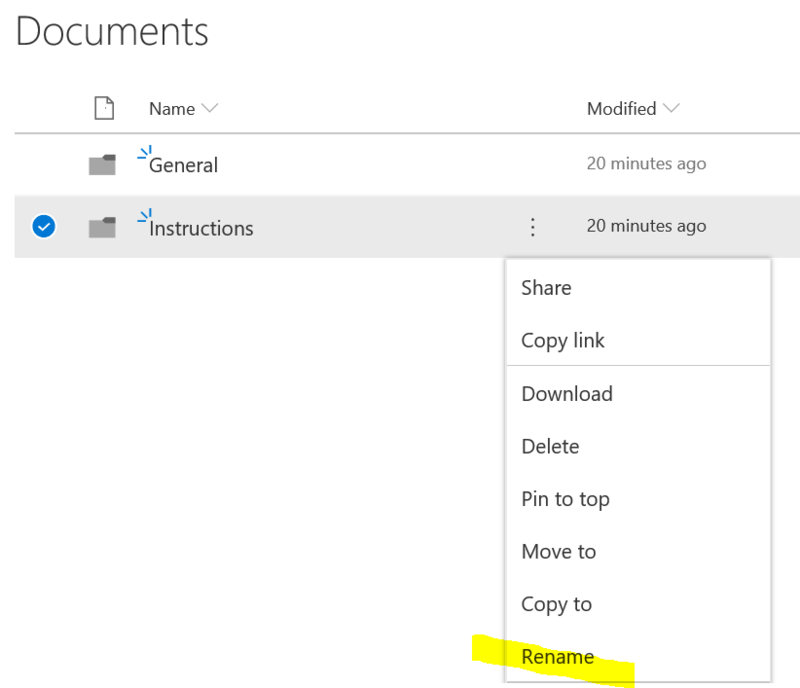 Recommended solution: Move the files out of the channel (example: move all files from “Instructions” folder) to a temporary folder in SharePoint. 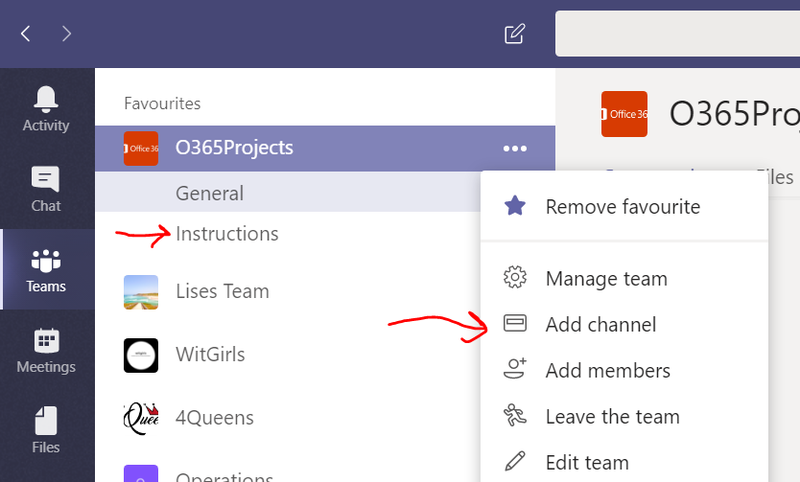 Then delete the channel and folder, and in Teams create a new channel with the name you want. Then move the files back from the temporary folder into that new channel’s folder. That worked because the connected folder was still on SharePoint. What if we had deleted the folder in SharePoint also, and tried to restore the channel? Then it will restore the channel, and as soon as you click on the “Files” tab it will add back that folder to the library on SharePoint BUT the folder is… EMPTY!! So your files are gone! Teams will not restore your files. I looked in the recycle bin on SharePoint and you can restore the files from there, but it gets stuck on Restoring so not sure that will work. You cannot access the files inside folders from the recycle bin, so that may not work. Recommended solution: For governance and traceability, do not delete the folders from SharePoint! Then you know you can always restore a channel after it is deleted and the channel will connect back to the original folder. 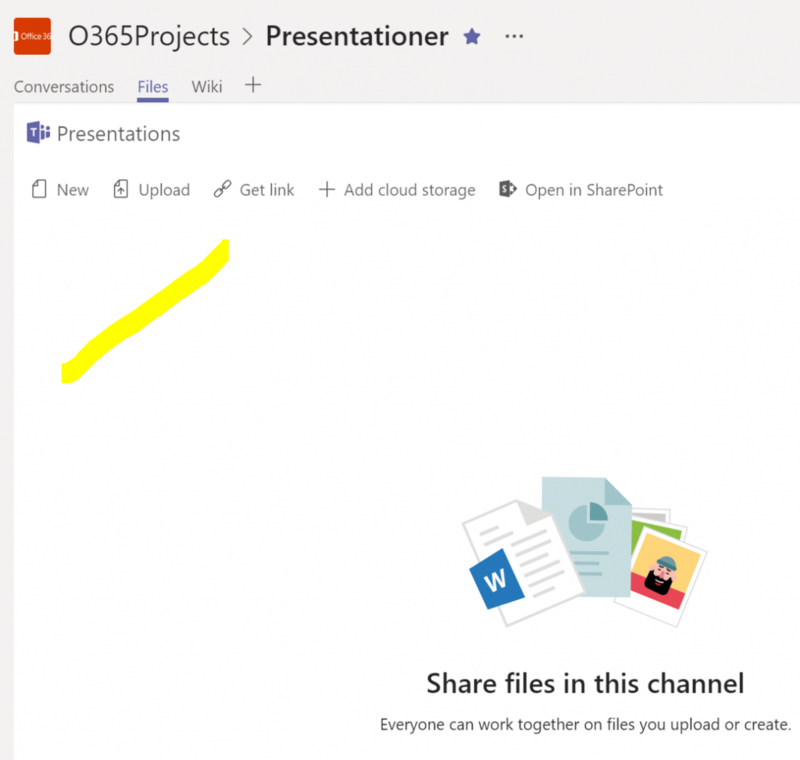 Go back into SharePoint to find a new folder added called “Presentations”. So SharePoint will add a new folder automatically. What if we want to restore the deleted folder and files then? We did delete this by mistake! Well, that restore does not seem to work, it is stuck on “Restoring”.. So these files are probably gone! Recommended solution: Go into the tab “Channels” and restore the deleted channel. Then the connection to the folder will work and you will get back the conversations etc. We meet one of the keynote speakers Sofia Edholm from Microsoft. She talks about her role and also shows us the brand new Surface Go! We meet Wictor Wilén from Avanade and talk about his brilliant session “Building apps for Microsoft Teams like a boss”! He talks about bots, Teams App Studio, news in Teams and more! We meet Göran Husman, our favorite tutor! His session was about better collaboration with Office365 and we loved his presentation! He talks about his current role and how he helps the customer to adapt the new collaboration tools. We meet Christian Ståhl and one of his students, Gentrit Sahiti, who just graduated and they talk about the EC Education programme and what happens afterwards. Christian has been a teacher there since the start in 2012 and Christina has also attended that training! After this interview, at the raffle from the sponsors, Gentrit won Rencore’s price which is a ticket to Collaboration Summit in Germany next year!! A great prize and we were so happy for Gentrit, congratulations and good luck in the future!! Last interview for the day is with Jens Weil who is the organizer of SharePoint Saturday in Stockholm. Hear about his work with the preparations of this conference and how it went today. We want to thank Jens for an excellent conference and look forward to the next! We got a mail from a listener who asked if we could interview a SharePoint consultant to hear about their daily work and challenges. And your wish is our command so I asked a very cool and sharp woman, Jenny Hedin, to come to the show and share her story with us. Thank you for listening and please subscribe and rate our podcast if you like us! Cheers! Exception: System.Data.SqlClient.SqlException (0x80131904): User does not have permission to perform this action. You do not have permission to run the RECONFIGURE statement. Checked first that all services ran with correct accounts, had to change two where Local System was set (why?? do not know), checked that the SQL services service was running on the SQL server, checked that the farm account still had DB_Creator rights on the content db’s, and all seemed correct. And that fixed it. As usual, make sure to go into Central Administration and start the User Profile Synchronization service as that rarely starts after upgrades like this. Also checked the Health Analyzer and got rid of all messages regarding upgrade needed. Checked all services and last thing, click on “Upgrade and Migration” link in CA to see that the messages about Incompatibiliy range were reset to “No action needed”. Not sure what effects it will have to keep the farm account as SysAdmin at the SQL server but I will keep it for now! Episode 9 Hub Sites, Teams & More! It’s been a while since our last episode so this is a longer one, and we have lots of things to talk about. We are talking Hub sites, Teams, SPfx, SPO, powershell and other topics! Link to Vesa Juvonen’s tutorials on YouTube is here. Hope you enjoy it and please rate our podcast if you like it, we would be very grateful for your feedback. Help us improve WitGirls Podcast! We have recorded 8 episodes of the WitGirls Podcast now and we think it is time to hear your opinion about the podcast! So that we can improve it, maybe talk about something that you would like us to discuss and you can suggest a guest even. We would be very grateful and happy if you wanted to answer a few questions and also rate the podcast. We really appreciate your feedback and comments – good as bad ? Thank you very much for taking time to answer these questions! I have launched a podcast called “WitGirls Podcast” and it will be hosted by me and my friend Christina. We have both long experience from working with SharePoint/Office365 and also from working within the IT business. I also listen to a lot of podcasts, but there aren’t so many in this world that is run by women. So I thought it could be fun to start sharing our experience and also we will invite guests to the show. In the first two episodes we present us, our background and what we work with. In upcoming shows we will invite guests and also deep dive into issues or apps that we are working on. Or topics related, there aren’t really any rules – I don’t like rules – and we can talk about whatever we feel like. If you would like to be our guest, contact us at witgirlspod@gmail.com. Read more on our website witgirlspod.wordpress.com. You can listen to us on SoundCloud or iTunes. Hope you will enjoy the show, and remember – it’s our thoughts and opinions in the podcast, not Microsoft’s or any other product’s views. We do not have any sponsor. This is for fun and I strongly believe that sharing is caring! Hope to see you on a SharePoint somewhere! Cheers! This post describes how to move SharePoint 2013 SP1 OnPrem server SQL content databases from SQL 2012 to 2016. This means that there is no upgrade involved, only a move to a new SQL Server Cluster. It worked really well. Even if I read lots of articles that it is not supported to run SharePoint 2013 on SQL 2016 it does work if you follow the steps below. This is an on prem server and the customer does not have an active SP admin, so I wanted to make sure the server was in a fresh state. I checked the messages in Health Analyzer and noticed that there was an Upgrade message which I wanted to correct first. All content databases had the message “Database is in compatibility range and upgrade is recommended”. I guess some other administrator had done an update on the server but missed the part with running the SharePoint Config Wizard afterwards. So I did just that, and once the Wizard was completed the messages were gone. I also checked that the UPS and Search etc was running fine without any errors. Now that the servers are fresh, do an entire backup of all content databases and take a snapshot before you start, in case you must make a rollback. I always document the server configuration before I start any changes on a server, to make sure all services runs with the same accounts and mostly because my memory is really bad and it is easy to forget something. So I take screen shots of the Services with the SP accounts that are running, I document “Services on server” inside SP, etc. I also look at the SQL server instance in the “Security” and “Permissions” areas to see what accounts are there and the roles they have. This is important, otherwise you will not be able to connect to the config database later. Do not move over old databases, keep the servers fresh and without old data. So I checked what databases to be moved. I discovered that there were two Config databases, so only one of them should be moved into the new SQL server. Also, some “test” databases were there for old web applications that no longer was in use. So only move the databases that you actually use. You can see a list of which databases that are in use, if you go to “Upgrade and migration” in Central Administration and click on “Review database status”. There are all the content databases listed that SharePoint uses. Make sure all accounts that are used on the “old” SQL server are setup the same way on the new SQL server instance. Check dbo, security roles and permissions. You may have to select the dbo account in “Permissions” and check what roles it has, like “Connect to databases” etc. Then select the service accounts, they may have a different role setup. We did not move the databases, but copied them to the new SQL Server. You’ll need both .mdf (database) and .ldf (log) files. In Management Studio on the new SQL server, right-click the server or instance, then click Attach. In the dialog box, click Add, then select one database. Click OK to finish attaching the database. Repeat for all databases. This is an important step. 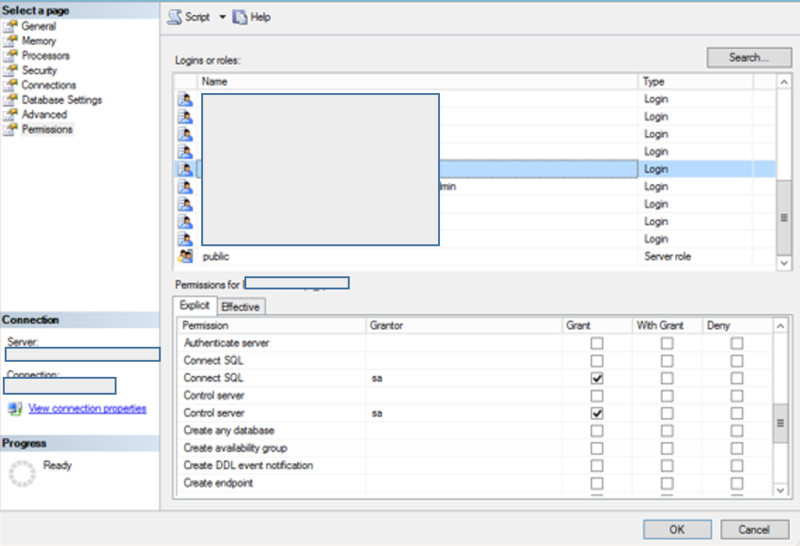 If you don’t assign the correct security roles, permissions and dbo to the databases the connection will fail from the SP server. When you attach databases to the target SQL server, your user account becomes the DBO of the databases so make sure you assign that back to the Farm Account. You can now shut down the “old” SQL Server to make sure this step below really works. Now we will force the SharePoint servers to use the new SQL Server instance. To do this, we will add an Alias in CLICONFG.EXE so run that on the SP server. Click on the tab “Alias”, and then on “Add” (if it is empty, which it was on my server. If not, then “Edit”). Do the setup according to this image, it is self explanatory. Very smart actually. It may take a while before this connection works, so maybe restart the “Browse SQL” service to refresh that and if you have done all steps above correct, it should work as soon as you have done the last step below. 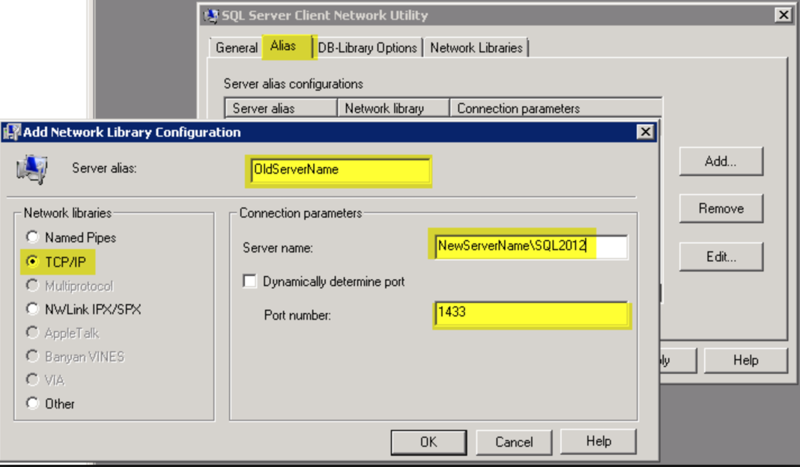 The alias is used to redirect the connections from the original source SQL server to the new SQL server. Repeat this on each and every SharePoint server. NOTE: Do NOT forget to add the SERVER INSTANCE after the SQL Server names (on both the original and the new target SQL servers) otherwise the connection will fail. Start the SharePoint services in Windows Services again on each SharePoint server. They should be started in the reverse order from how you stopped them. Check that Central Administration fires up, if you are lucky – then all is back up again! Also make sure that all service applications like UPS (I always have to start that service manually from within SharePoint CA), Search etc are up and working. For me, all this was working as before. And last but not least, make sure all your sites are running!